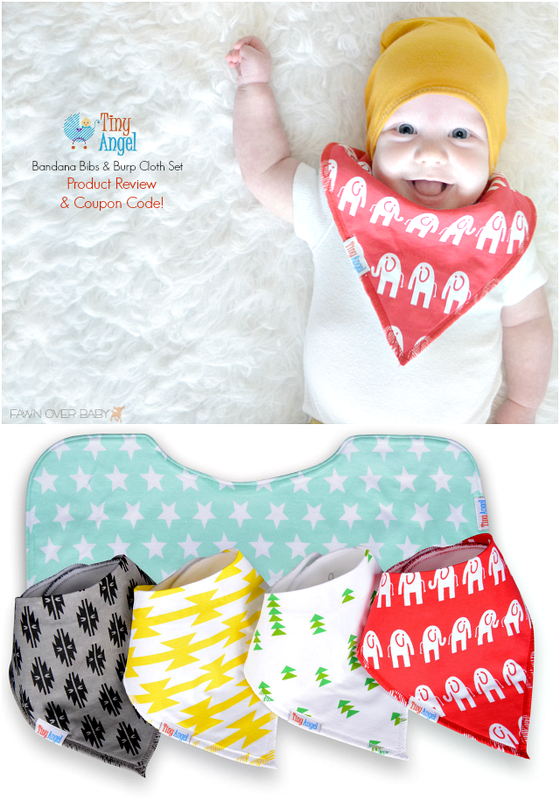 Fawn Over Baby: Bandana Baby Bibs & Burp Cloth Set From Tiny Angel + Promotion Code! 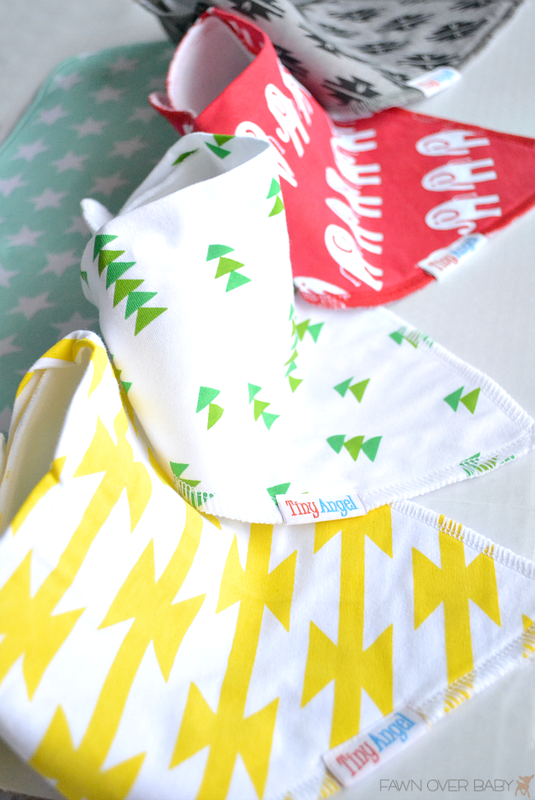 Bandana Baby Bibs & Burp Cloth Set From Tiny Angel + Promotion Code! Hi friends! 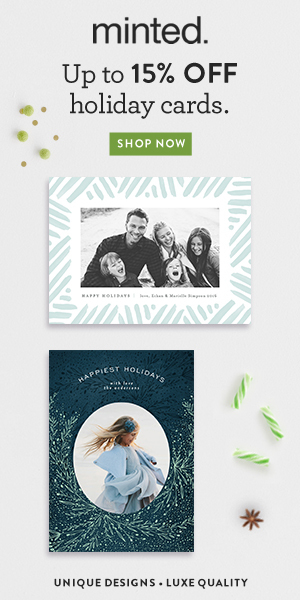 I am so excited to share with you a product we received last week that I know you will absolutely love! With Haines growing like a weed, the constant slobber is not too far behind. 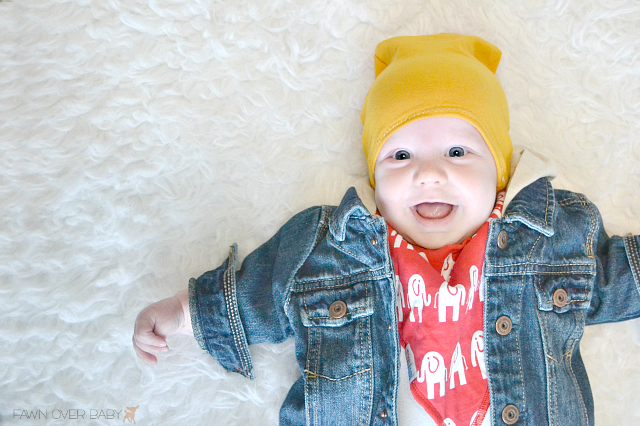 Already at 4 months, he is able to drench his neckline and anything that is in reach. Tired of the multiple bib and wardrobe changes 3 times a day, the wonderful baby acessory company Tiny Angel couldn't have come into my life at a more perfect time. 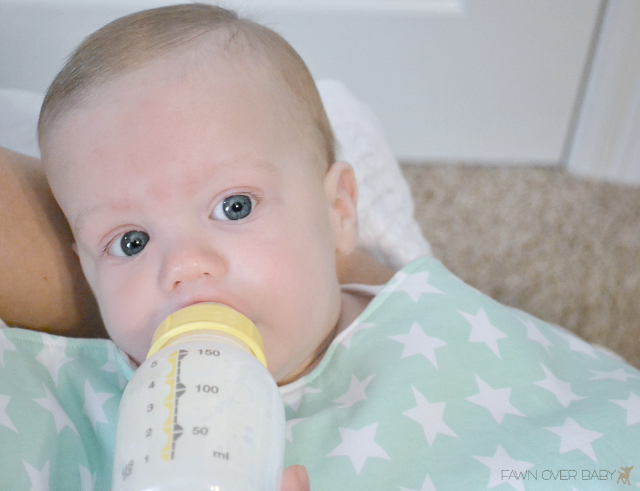 The wonderful Tiny Angel Co. specializes in baby products geared toward infants and toddlers. 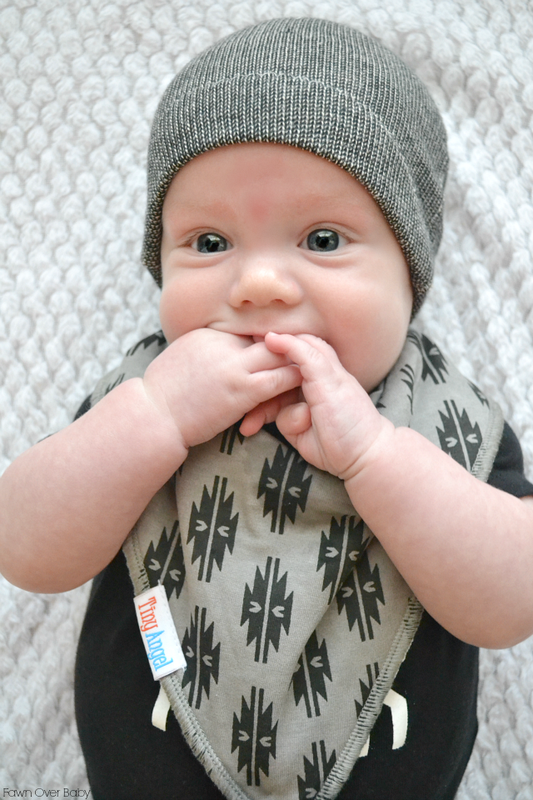 Their bandana bibs and burp cloth set comes in a pack of 4 fashionable bibs and one amazing burp cloth. 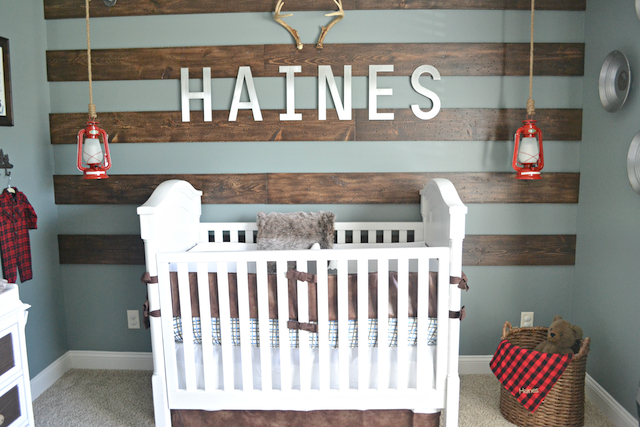 Not only do they come in an array of adorable gender neutral designs, the quality and functionality is top notch! 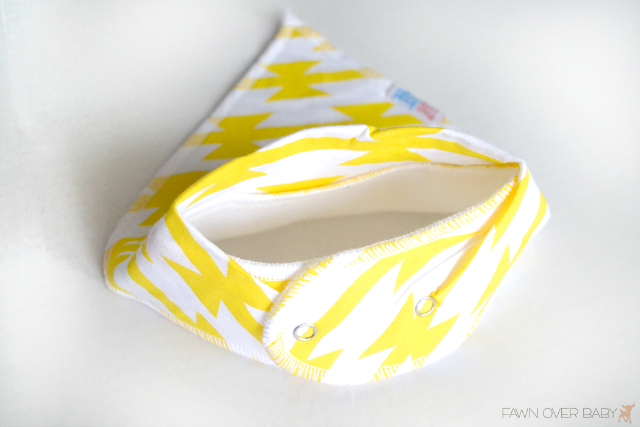 The bandana bib has always been my favorite bib design. It not only catches the buckets of drool from my teething baby, it acts as a fun and trendy accessory as well. With aztec designs still going strong in the fashion world, Tiny Angel has made sure that their bibs are functional and fashionable to enhance your babe's Outfit not hide it! 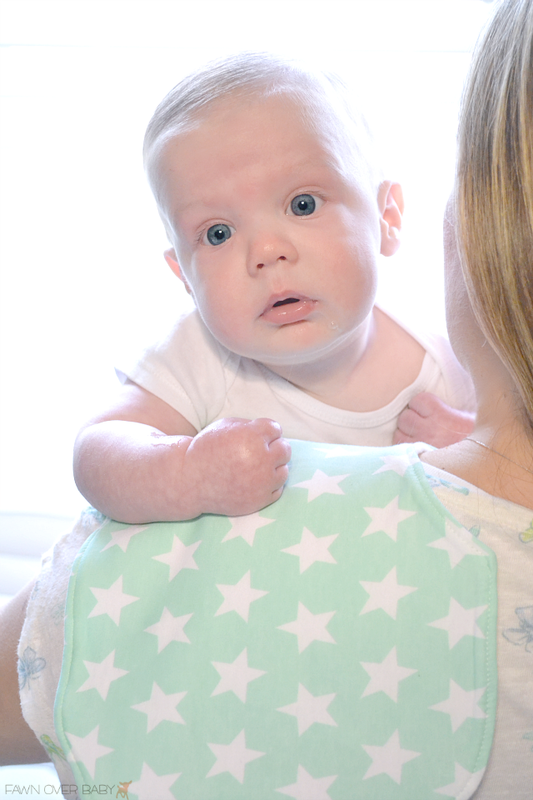 Made of 100% Cotton with a thick fleece back, these bibs are super soft, comfortable and incredibly absorbent! 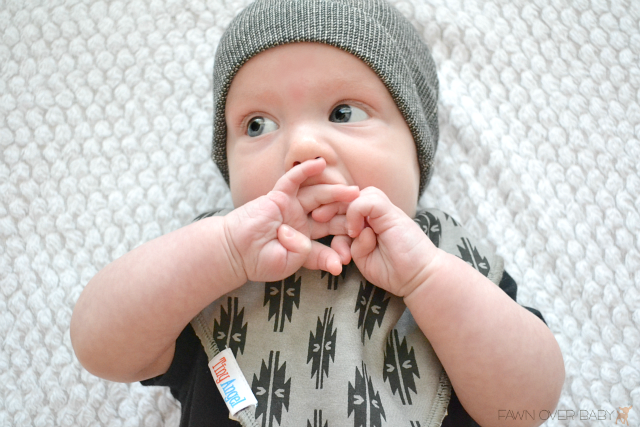 One of the many details I love about these bibs is the velcro-free adjustable snaps. 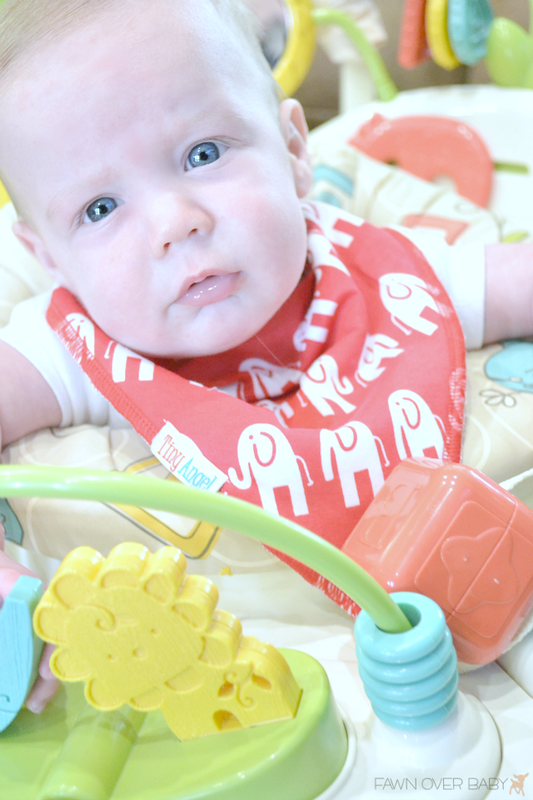 The adjustable snaps allow for the bib to grow with your baby and velcro-free means no more pulling or falling off as velcro closures tend to do. The neckline is also a wonderful plus. It's fold over hem creates a snug comfortable fit around the neck without being too tight. 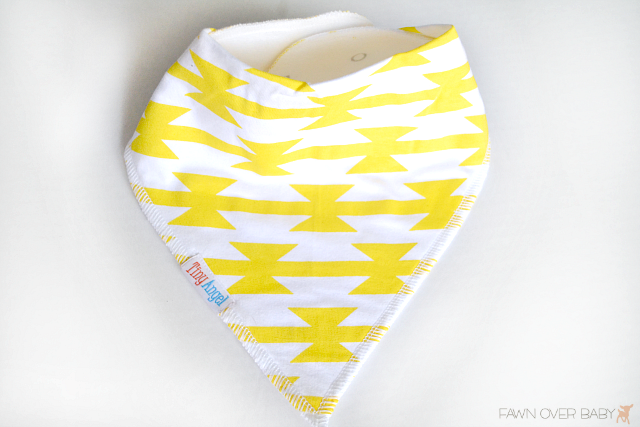 No more drool or spit up creeping down the neck with these! 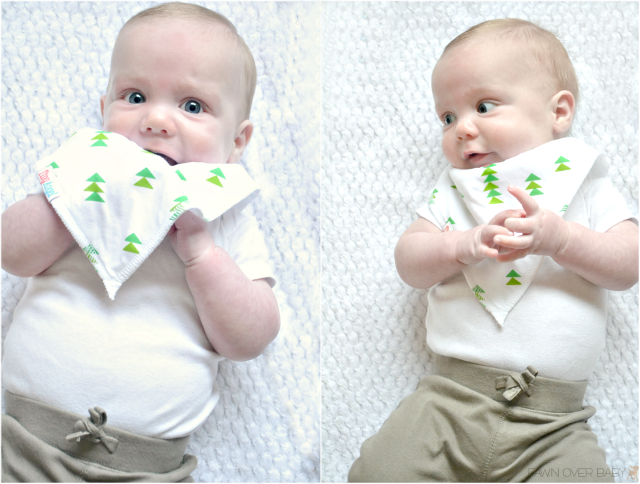 As you can see in these photos, slobber is making it's way onto the bib. By the time I was through capturing his play time, his bib was drenched in slobber yet his clothing had not a drop on it. If you're like me, laundry isn't your favorite thing to do yet you feel like it's all you do day in and day out. 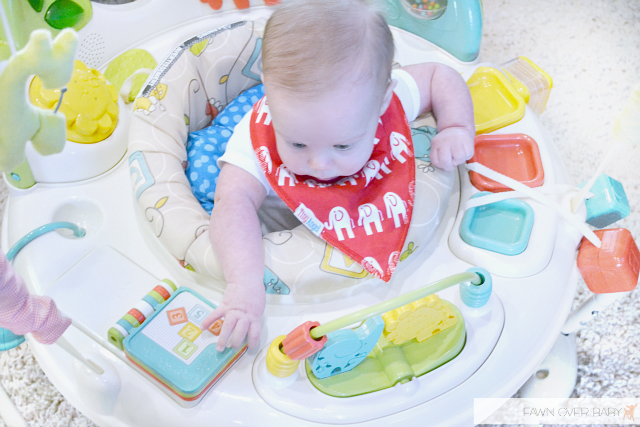 The absorbency of these bibs helps reduce the amount of "wardrobe changes" which in turn reduces the amount of round trips to the laundry room! Yesss! 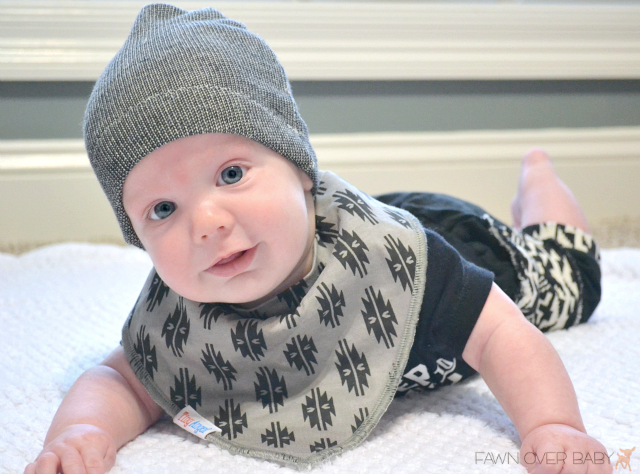 Another reason why these bibs are great is their on-trend patterns and colors. They make the cutest accessory and will accent any outfit that I have my son in. My son's favorite past time is jumping and reaching in his bouncy activity center. When he gets going, it is the cutest thing. You would think he is gearing up for the High Jump at the Olympics. With all that rigorous play comes a crazy amount of drool. I found myself constantly having to disassemble and wash the seat cover almost after every use. Now that he wears his Tiny Angel bib, his drool doesn't make it past the thick cotton of his bib which means one less thing I have to wash for the day! 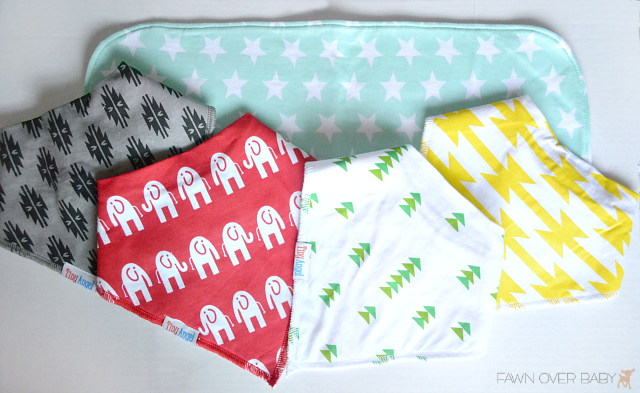 With every 4 pack of Tiny Angel bibs, a contour burp cloth is included. 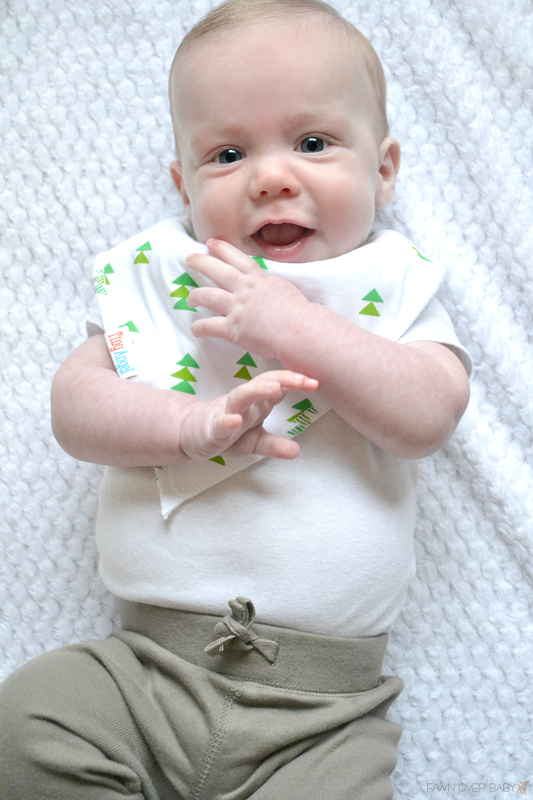 This burp cloth is super soft and made with the same high quality, super absorbency 100% cotton as the bibs. The contour cut-out is a wonderful feature for two reasons: One, the contour cut-out fits snugly around my neck and drapes perfectly over my shoulder allowing for wider coverage. 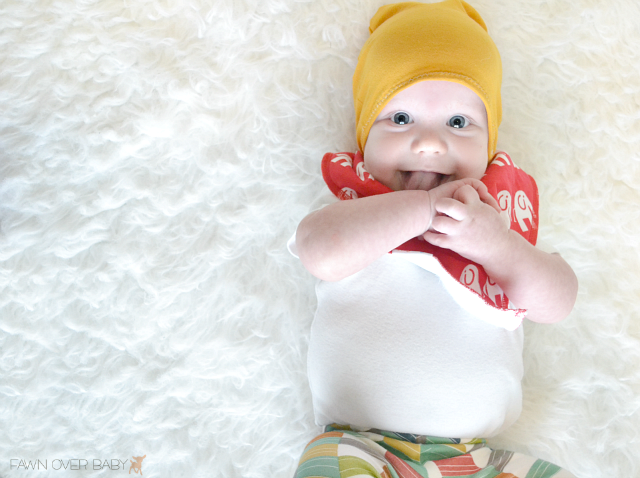 The super soft fleece also helps to prevent the burp cloth from sliding around or off for that matter making it easier for you to multi-task while burping or holding your baby. Two: When I am bottle feeding. The curve rests nicely around my son's neck and chest catching any milk spillage or spit up that often accompanies meal time. Another note to add is because of the high quality cotton and fleece, these hold up very well in the wash and I haven't had a problem with them shrinking as I have with most of our other bibs. Worry-Free washing is a reason to celebrate, am I right? 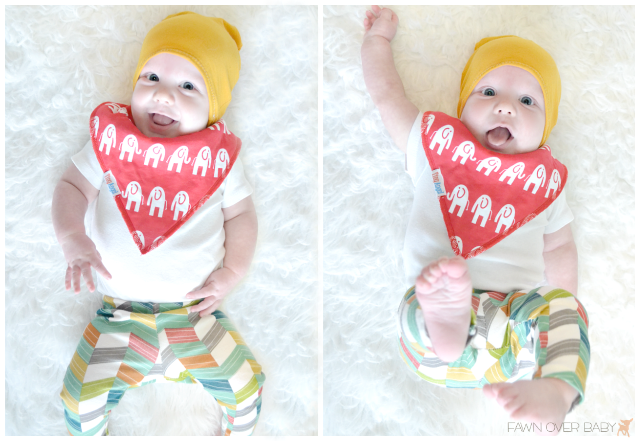 I can't say enough about these bibs and burp cloth set. I definitely recommend all expecting mothers to add this set to their registry and if you are looking for the perfect gift for someone expecting, you can't go wrong with these mommy and baby approved accessories! To Shop Tiny Angel, They Can Be Purchased on Amazon Here. And To Welcome You To The Tiny Angel Brand, They are Offering All Fawn Over Baby Readers $5 OFF your purchase! Just use coupon code: BIBS5OFF at checkout to receive your generous discount!